Richard Vaughn is one of the most inspirational people in the T1D community. I first learned about Richard while researching for The Marathon We Live: Training for a Personal Best in Life with Type 1 Diabetes. Similar to the book's inspiration, Linda, who had lived with T1D for over 62 years, Richard was diagnosed with T1D in some of its most experimental times of therapy. He shares his experiences in his book, Beating the Odds, and regularly updates followers via his Facebook page, Diabetes Health From Richard Vaughn, 70 years of Living with Diabetes. Here, Richard shares his insights about living with T1D through seven decades. I was diagnosed with diabetes at age 6 in September 1945. There is no record of the actual date, but my mom and I remembered it was a few days after my birthday on Sept. 10. I had always wanted to have a day for my diagnosis, so eventually I chose Sept. 15 as the day that I recognize my D-anniversary, since that cannot be more than two or three days off the actual date. Richard in the first grade at age 6. My doctor called it "sugar diabetes." There were no "types" back then, and everyone diagnosed was given insulin taken from the bodies of pigs and cows. Prior to my diagnosis I had chicken pox and mumps. The symptoms of diabetes appeared while I was recovering from those diseases. There has never been any type 1 among my relatives, so I think the other diseases caused internal damage that caused my diabetes. Very little was known about diabetes in the 1940s, and my parents took me to four doctors before my symptoms were recognized, and my blood was tested for sugar. I had lost much weight, and it was difficult for me to walk. The insulin worked a miracle for me, and I was in great shape just a few weeks after being released from the hospital. There was no way of testing blood sugar at home, so we tested my urine instead. A special procedure involving a test tube with a solution containing drops of my urine was boiled on our stove. The solution changed color, and that gave some indication of how much sugar was in my urine. Each morning my urine was tested, and there was an injection of the animal insulin. There was no other testing or insulin dosage until the next morning. I was a poor student in school for several years, and my diabetes was very unpredictable, with much high and low blood sugar. There were seizures during some nights with low blood sugar, but my parents were always able to take care of me then. I was not permitted to participate on the playground or in the gym at school, to assure that I would not have low blood sugar while I was away from home. My life was not normal at all. I sat and watched the other kids. My classmates ignored me and I had no real friends in elementary school. 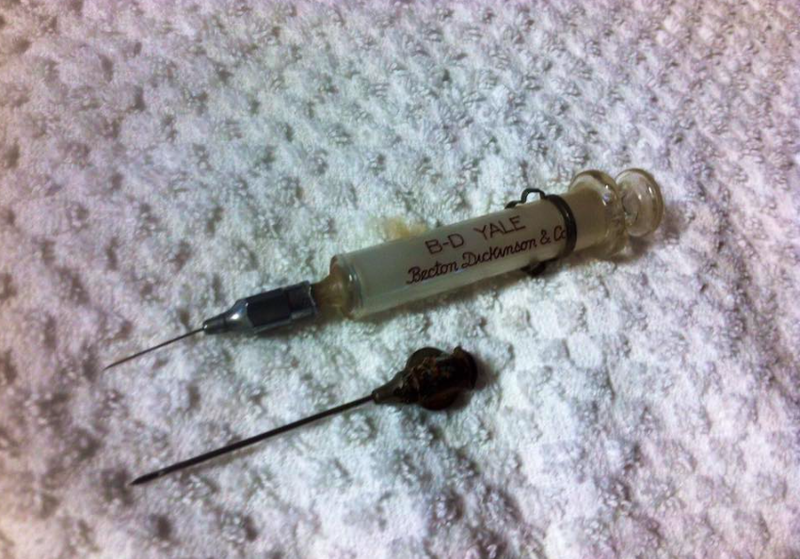 Before standardized dosing tools, syringes were much more delicate and time consuming. Insulin (as Richard mentioned from pigs and cows) was much less pure or predictable. In the eighth grade, I had a very bad case of the flu. My parents stopped giving me insulin because they thought if I was not eating, then I did not need insulin. Of course that is not true, but it seemed to make sense back then. I was so weak that I could not lift my head off my pillow. I could not keep anything in my stomach, not even water. The doctor visited our home and had me hospitalized. I recovered while in the hospital when my insulin dosages were given again. Carb counting was not a common practice while I was growing up. My doctor told us that I should avoid sugar at all costs, but he did not say anything else about how I should eat. Carbohydrates were never mentioned. My mother made me pies, cakes and cookies sweetened with saccharin. I think that was the only artificial sweetener available in my childhood. I did not find out about carbohydrates and their effect on blood sugar until 1988. I was a good student in high school, and graduated number thirteen. I entered college in the Fall of 1957, and majored in mathematics. Things were good there, and I had better control of my diabetes. I made friends and started dating a few girls. I graduated with honors, and attended graduate school at Virginia Tech in 1961. After two years of graduate work, I graduated with a master's degree in statistics. In the summer of 1962, I was a part-time math teacher at Roanoke College. During my first year of full-time teaching I met a young female student, and we dated a lot that year. We married in May, 1964. We had two sons born in 1966 and 1969. My teaching was going well, but there were times when my blood sugar would be very high, or very low. My wife was very good at taking care of me when I had hypoglycemia. The 1970s did not bring any new developments that helped my diabetes. My urine testing was somewhat improved when a product called Tes-Tape was introduced. I could use strips of tape to test my urine, and the boiling of a mixture was no longer necessary. I started testing before each meal, and chose food and portion sizes based on the test results. Still, my diabetes control did not improve very much. An early blood glucose meter from the 1980s. In the mid 1980s I bought my first glucose meter. It had been 40 years before I was able to finally test my own blood sugar. I saw very high blood sugar almost every time I tested with the meter. Numbers in the 200s and low 300s were frequently seen, and there was no fast-acting insulin to correct those highs. A1c tests were first available in 1976, and my doctor had my first A1c test done in 1980. I think it was a 12%. In 1988, I found a magazine article about carbohydrates, and I started reading labels on products. I began limiting the number of carbs I ate, and my meter started showing lower blood sugars. My A1c's improved. In the mid 1990s I started basal and bolus insulins. By the end of that decade my A1c's were in the high 5's and low 6's. I had very little contact with other diabetics until 2006. That was the time that I joined dLife.com and had my first discussions with other type 1 diabetics, online. Later on I joined Diabetes Daily and TuDiabetes. I spent hours each day talking to my new online friends about type 1 diabetes. They were interested in what it was like to be a diabetic in the 1940s and beyond. I wrote many posts, and it was suggested that I should publish them. That is how my book came into being. My autobiography, published in 2010, is called "Beating The Odds: 64 Years Of Diabetes Health." Interacting with type 1 adults, and the parents of type 1 children, is one way I enjoy giving back to the DOC. I have communicated with many parents, and encouraged them, letting them know that their children can grow up to do almost anything they want. The life expectancy of newly diagnosed type 1 diabetics in the U.S. is almost as good as it is for non-diabetics. Parents are very pleased to hear these things. The parents are very optimistic after hearing about long-term, healthy type 1 diabetics. They have hope for the futures of their children. That makes me feel I have done something good for them. Richard's 50-year Joslin Medalist Award. 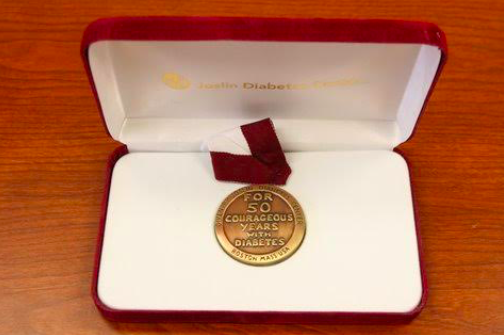 I have received the Joslin medal for living with type 1 for 50 years, and in 2020 I will be eligible for the 75-year medal. This has meant a lot to me, because I was able to participate in the Joslin Medalist Study. Dr. George King, Joslin Chief Scientific Officer, who's heading the study, hopes to find the factors that have enabled so many of us to live long lives, without serious complications. There have been more than a thousand participants in the study, and very interesting discoveries have been made. The medalists meet in odd numbered years in Boston. It is wonderful to be able to compare stories, and get to know other medalists. There is a private Facebook group for medalists, where we have very interesting conversations. In retirement, Richard stays busy as an active member and inspiration in the T1D community. Now in retirement, I have established a routine lifestyle that was impossible beforehand. A regular day-to-day schedule has made my diabetes much easier to control. I started using a pump in 2007, and my A1c's have been in the 5.4 - 6.4 range for many years. There are very few bad lows or highs, and when they do occur, they are easily managed. I have been very lucky to have a long healthy life with type 1 diabetes. I have no diabetes-related complications, except for some mild nerve damage. It has been a wonderful life. My wife and I celebrated our 51st wedding anniversary in May of this year. Our sons are now ages 49 and 46. They have good jobs and fine homes, and we have two wonderful grandchildren. Neither our sons nor our grandchildren have diabetes. We are very pleased about that! We thank Richard for his contributions to Every Step Counts and want to make readers aware that Richard first shared his article with Healthline.com in 2015, which can be found here. Older PostMedical IDs, T1D Moms, and...Discount on RoadID!